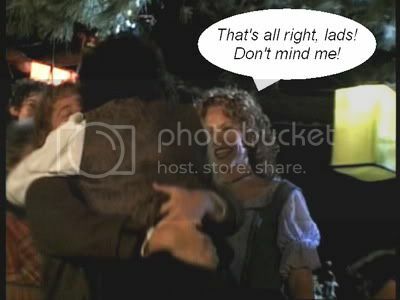 As for the TE Extra scenes showing F/S hugging, that first one of Sam embracing Frodo with Rosie looking on, grinning in delight, makes me chuckle. Frodo/Sam ... I think I've accepted the view, and I suspect I have always taken this view, unconsciously or not, that Frodo and Sam are essentially straight guys who are in some way soulmates. The BBC LOTR radio adaptation does nothing to dispel that view, with its wonderful - and more canon-based - portrayal of the depth and intensity of the bond that gets forged between Frodo and Sam, particularly in Mordor. The BBC Grey Havens ...!!!! *sob* In terms of storytelling, I prefer the BBC Grey Havens, but love the hugs and kisses in PJ's version. Very hobbitlike!! However one reads it, it's a very beautiful and moving relationship. Ah, Pearl, I'm almost off to have another try at seeing Goblet of Fire again (NOT at the "dome Omnimax" this time). ... I think I've accepted the view, and I suspect I have always taken this view, unconsciously or not, that Frodo and Sam are essentially straight guys who are in some way soulmates. Yeah, me, too. But the Sam/Frodo premise has inspired many fine fics, some of which I really enjoy. When the fic is really good, and done in a Tolkien-faithful spirit, whether funny or serious, I am willing to suspend my disbelief and surrender to the story. Otherwise, I can't get into it. When I think any story (no matter what its sexual category) really does a job on these characters, making them behave in ways that are seriously OOC, I can't enjoy it. Ah, the BBC LotR. You know, Pearl, I listened to that whole set again recently. I like it better each time. Do you rememeber how I said in the K-D thread on the production that I thought Peter Woodthorpe's Gollum was waaaay over-the-top, with far too much scenery-chewing? Well, I have come to really appreciate his performance. Now I look forward to his scenes. I had to scroll back up and take a look. Considering I was talking about how the sequence fed the S/F slash take on the relationship, that really IS funny! HA! The BBC LOTR totally rocks. I much prefer Movie Eowyn to BBC Eowyn though, who sounds like she's in a Jane Austen novel rather than LOTR! Peter Woodthorpe's Gollum is beyond awesome: menacing, scary, insane, tragic, tormented, hilarious and pitiable. BBC Pippin ... such a cutie!!! !